Turkish Airlines Saturday have begun to implement regulations forbidding passengers from carrying electronic devices larger than cell phones aboard the plane, as announced on the airline’s website on Friday. According to an Anadolu Agency reporter present at Istanbul’s Ataturk Airport in Istanbul, Turkish Airlines personnel have taken passengers’ electronic devices such as tablets and laptops at the boarding gate and stored them in special containers . Passengers were asked to leave tablets and laptops to be stored in the baggage hold. 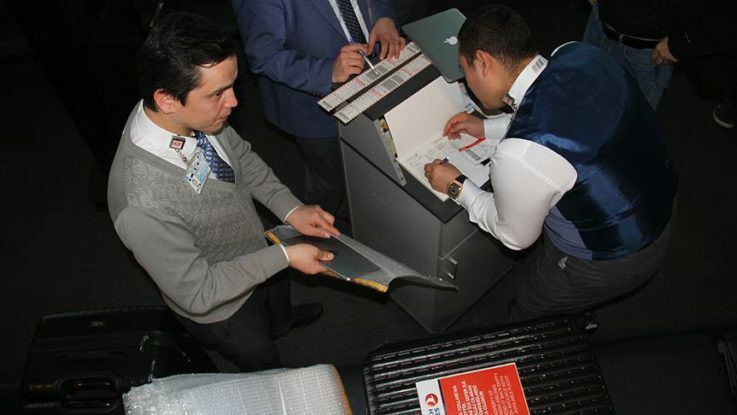 “The electronic devices will be received by an airline officer during the last check-in before boarding the aircraft and will be placed in a special shatterproof luggage after being wrapped in foam covers,” Turkish Airlines CEO Bilal Eksi told Anadolu Agency on Friday. “We guarantee that passengers’ devices will not be damaged or lost,” Eksi added. On March 21, the U.S. Department of Homeland Security said the restrictions would apply to flights from 10 foreign airports in eight Muslim-majority countries, including Istanbul’s Ataturk International Airport. The U.K. later issued a similar ban on all flights from airports in Turkey, Lebanon, Egypt, Saudi Arabia, Jordan and Tunisia.